NASA engineers received a transmission from Opportunity on Sunday morning—a positive sign despite the worsening dust storm. Data from the transmission let engineers know the rover still has enough battery charge to communicate with ground controllers at NASA's Jet Propulsion Laboratory in Pasadena, California. Science operations remain suspended. Sunday's transmission was especially good news considering the dust storm has intensified in the past several days. A dark, perpetual night has settled over the rover's location in Mars' Perseverance Valley. The storm's atmospheric opacity—the veil of dust blowing around, which can blot out sunlight—is now much worse than a 2007 storm that Opportunity weathered. The previous storm had an opacity level, or tau, somewhere above 5.5; this new storm had an estimated tau of 10.8 as of Sunday morning. 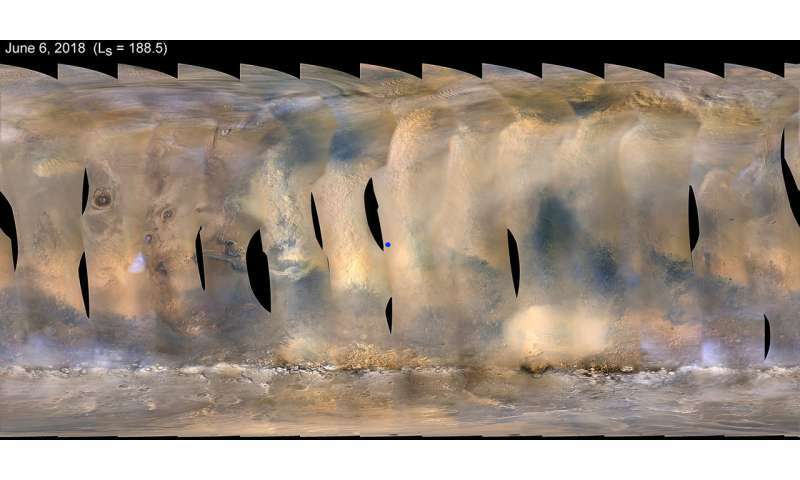 NASA's Mars Reconnaissance Orbiter first detected the storm on Friday, June 1. As soon as the orbiter team saw how close the storm was to Opportunity, they notified the rover's team to begin preparing contingency plans. In a matter of days, the storm had ballooned. It now spans more than 7 million square miles (18 million square kilometers)—an area greater than North America—and includes Opportunity's current location at Perseverance Valley. More importantly, the swirling dust has raised the atmospheric opacity, or "tau," in the valley in the past few days. This is comparable to an extremely smoggy day that blots out sunlight. The rover uses solar panels to provide power and to recharge its batteries. Mars Reconnaissance Orbiter and two other NASA spacecraft orbiting the Red Planet —Odyssey and MAVEN—routinely support rovers on the ground. Martian weather certainly is not some thing to write home about and if those balmy summer martian evenings whip up dust storms lasting months, it is hardly worth waiting through the martian winter to lose site of the summer sun in a planet obscuring 4month dust storm as those evil dust sprites spin your nerves to tatters. I agree. And I would never be content to live on a planet such as Mars where there are no blue skies and white clouds to look at in daylight. It is depressing just thinking of what astronauts of the future will have to contend with while living on the Mars surface or underground. It might be different for an individual human who was born on Mars and never experienced the beauty of Earth. I suppose that many of the future Mars settlers would prefer suicide if they were not allowed to return to Earth...ever.